British Academy awarded £4,317 to develop comparative research on the institutionalisation of parkour. Project entitled: 'The politics of parkour: transnationalism, youth and social policy' (2010). The Brighton and Sussex Community Knowledge Exchange awarded £10,000 for a project entitled: 'Documenting parkour: understanding the social benefits of a lifestyle sport'. 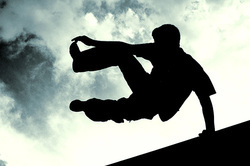 This explored the development of parkour culture in Sussex (2008). Gilchrist, P. and Wheaton, B. (2017) ‘The social benefits of informal and lifestyle sports: a research agenda’, International Journal of Sport Policy & Politics, 9(1), pp.1-10. Gilchrist, P. and Osborn, G. (2017) 'Signposting risk: parkour parks and the materialities of regulation', in Turner, D. and Carnicelli, S. (eds.) Lifestyle Sport and Public Policy. London: Routledge, pp.157-179. Gilchrist, P. (2017) 'Countercultural sport', in Kelly, J., Bairner, A. and Lee, J. (eds.) Routledge Handbook of Sport and Politics. London: Routledge, pp.388-400. Gilchrist, P. and Wheaton, B. (2016) 'Lifestyle and adventure sports among youth', in Green, K. and Smith, A. (eds.) Routledge Handbook of Youth Sport. London: Routledge, pp.186-200. Gilchrist, P. and Wheaton, B. (2013) 'New media technologies and lifestyle sport', in B. Hutchins and D. Rowe (eds.) Digital Media Sport: Technology and Power in the Network Society. New York: Routledge, pp.169-185. Gilchrist, P. and Wheaton, B. (2011) 'Lifestyle sport, public policy and youth engagement: examining the emergence of parkour', International Journal of Sport Policy and Politics, 3(1), pp.109-131.